From the previous article entitled ‘Spirituality – Why and What ?? ?’ , we now understand the deep desires of the soul and its eternal connection with the supersoul. 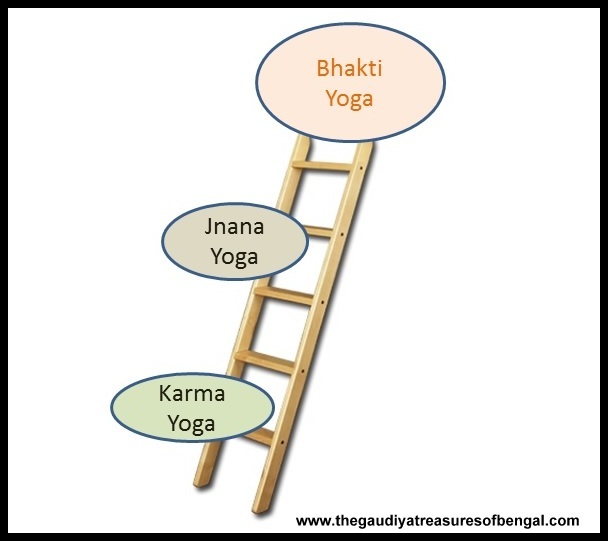 We understand how these fundamental hankerings of the soul are the very objectives ,that we try to achieve through the various avenues of this world; albeit unsuccessfully.Hence, ‘The Gaudiya Treasures of Bengal’ shall now discuss about the proper processes which have been well documented in the ancient Vedic scriptures, that guide us to achieve this much elusive fulfillment missing in our lives- by satisfying the very desires of the Soul. The process of uniting the soul and the Supersoul is also known as Yoga. The Bhagavad Gita, is considered to be one of the most sacred and revered books, that constitute the vast Vedic literatures.It comprises of seven hundred verses spoken by Sri Krishna, the Supreme Lord Himself, who descended in this world about 5000 years ago ,to give us a taste of His eternal sweet pastimes. The Bhagavad Gita encompasses the conversation between Sri Krishna and His friend Arjuna, in the middle of a battlefield, at a time when Arjuna was thoroughly disillusioned and confused as to what was his duty. Sri Krishna ,first of all, apprised Arjuna of the reality of our existence. All of us, including the various other life forms that exist, are spiritual beings, entrapped in a material body.The soul can neither be destroyed by any weapon, nor be damaged by water,fire or wind. The soul or the spirit ,neither takes birth ,nor does he ever suffer death.Instead, the soul goes through a process of transmigration, from one body to the next, in a quest of attaining perfection. The soul finally attains a stage of perfection when it is able to rekindle its lost relationship with the Supreme.Thus Lord Krishna taught Arjuna ,how the so called happiness and grief, success and failure, relationships, hankerings for name, fame and prosperity ,etc associated with this world, are actually based out of the assumption, that we are our bodies. Forgetting our eternal identity, we try to build our identities based out of the temporary objects of this material world, and suffer in the process. Instead, we should align our engagements and relationships, in a way to suit our actual (eternal) objective – to perfect our existence.In other words we should stop acting on a bodily platform, and start acting on a spiritual platform. The process of Yoga helps us in achieving this objective and enables us to harmonize our actions with our actual spiritual mission. Sri Krishna explains that all the creatures of this world are born with certain inherent natures and thus act according to their tendencies. It is of no use trying to artificially renounce action, as the mind and the body of a conditioned person (entrapped soul) is completely dictated by the nature he was born with. Hence, one should perform the prescribed duties as per his nature, and dedicate the fruits of his work as an offering unto the Supreme Lord. The key here is not to become attached to the results but act without desiring any profit or any claims of proprietorship.Thus though, one might not be able to change his activities,one can possibly change the consciousness with which he performs them. In this mood, without becoming envious or lusty, one should perform his prescribed actions, keeping the Lord in the center. Such a person is never bound up by the reactions of his work.This in a nutshell is the path of karma Yoga. From the above descriptions, it is quite evident that the science of Yoga is not sectarian, or is not something that is restricted to a particular community or a religious belief. Instead, it is something that applies to all creatures who want a way out of their material entanglement. Sri Krishna then continues that better than the process of Karma Yoga (non-fruitive action) described above, is the process of performing actions equipped with transcendental knowledge of the Supreme (Jnana Yoga).In order to help Arjuna get a taste of this higher knowledge, Krishna then explains to him, His own Supreme Position – how both He and Arjuna have taken several births before, but the difference between them is that though He remembers all of His previous births and activities, Arjuna does not. Sri Krishna reveals to Arjuna, that He Himself descends millennium after millennium ,whenever and wherever there is a decline in the religious practices, in order to annihilate the miscreants and deliver the pious, and to subsequently re-establish the religious principles. Sri Krishna further informs Arjuna how the different modes of material nature (modes of goodness,passion and ignorance) and the different types of work associated with these particular natures ( administrators, businessmen, laborers) , have been actually created by Him, to suit the different desires of the various living entities. But though He is the creator of this system, yet He remains completely unaffected and un-entangled by these modes of nature. Arjuna then learns how the great men of the past have perfected their lives, by performing their actions arming themselves with the sword of this transcendental knowledge of Lord krishna, the Supreme Personality of Godhead.Such a knowledgeable worker, whose every endeavour is devoid of sense gratification, is never bound up by the reactions of his work. Such a person, equipped with the weapon of Jnana ,is always satisfied and independent ,although engaged in all kinds of undertakings. After hearing Lord Krishna’s instructions on both Karma (performing action) and the importance of Jnana (Transcendental knowledge) , Arjuna got perplexed. He became confused as he found the path of action and cultivating knowledge to be contradictory to each other. Arjuna therefore inquired, whether renunciation of work or work in devotion – which of the two was superior. Lord Krishna then explained to him that work in devotion is always superior to renouncing work.He further explained that one who neither hates nor desires the fruits of his activities is actually renounced. Such a person easily overcomes the modes of material nature and is completely liberated. The steadily devoted souls attain unadulterated peace because they offer the results of their activities unto the Supreme Lord, whereas one who is not in union with the divine (not following the Yogic processes) is greedy for the fruits of his labor and gets entangled in the process. Therefore Lord Krishna instructed Arjuna, to perform his duty and steadily act for the satisfaction of Krishna.At the same time, Arjuna was instructed to fix up his consciousness upon the Supreme Lord and act with the knowledge that Sri Krishna is the supreme mystic, the master of all creation and the true goal of all sacrifices & austerities.Acting in such a consciousness, one attains true peace and fulfillment, which is otherwise unattainable by an embodied being. By constantly controlling one’s mind, withdrawing it from the objects of sense enjoyment, and proceeding with utmost determination and faith, one must fix his consciousness upon the Supreme Lord, and thereby ultimately attain the highest perfection of transcendental happiness. As a lamp in a windless place doesn’t waver, similarly, a yogi always remains steady in his meditation upon the Supreme. And what is the consciousness of such a yogi ? A true yogi observes the Supreme Lord in all beings and also sees every being belonging to the Supreme. He sees the same Supreme Lord everywhere. (Sarva bhutastham atmaanam Sarva bhutani catmaani, iksate yoga yuktatma sarvatra sama darshanah). As a matter of fact, all living entities (jiva) are the servants of the Supreme Lord and no matter what material condition he is entrapped in, the fact remains that his identity is ultimately spiritual and he is a part and parcel of the same lord.A yogi, whose consciousness is on a transcendental platform, is able to perceive these things as they are and hence acts with such realizations. The process of Dhyana Yoga explained above by Sri Krishna, however seemed impractical and unendurable to Arjuna, who then exclaimed that the mind is very restless ,unsteady and turbulent. Arjuna, one of the greatest fighters to have ever graced this world, then remarked that it was easier for him to control the mighty wind than to control his own mind. To this Sri Krishna replied, that the task of controlling one’s mind was indeed very difficult indeed, but it could be achieved by suitable practice and detachment. Arjuna then enquired about the fate of an unsuccessful yogi, to which Sri Krishna replied that – The unsuccessful yogi, after many many years of enjoyment in the higher planets, takes birth in a family of righteous people or into a family of rich aristocracy. Or else he takes birth in a family of yogis, who are great in wisdom, and receiving their association, he revives the divine consciousness from his previous life and automatically becomes attracted to the yogic principles. Such an inquisitive transcendentalist, striving for yoga, stands always above the ritualistic principles of the scriptures. A yogi, after many many births of practice, being washed of all contamination, ultimately attains the supreme goal. Hence Lord Krishna here declares that there is never a loss for one who strives for spirituality.Even if he does not achieve the ultimate goal in his present lifetime, he continues exactly from where he left off, in his subsequent birth. But who is the greatest of all the Yogis ? What are the activities of one who is the most intimately united with the Lord in Yoga ? Sri Krishna explains through all these verses, that by executing the above processes of strictly controlling one’s mind and senses (dhyana) , one should try to reach the transcendental platform, which is free from all the dualities of this material world. Situated in such transcendence , one should try to meditate upon the Supreme Lord with an unwavering mind.Such an elevated yogi is always conscious of the Supreme Lord and sees everything in relation to Him. But the highest of all the yogis is one, who with great faith always abides by the Supreme Lord and constantly thinks of Him within Himself, rendering transcendental loving service unto Him.Sri Krishna proclaims, that such a yogi (devotee) , is the most intimately united with Him in yoga and the highest of all. The process of Karma Yoga slowly leads one to enter the domain of transcendental knowledge. Performing work equipped with higher knowledge, gradually situates one in transcendence, liberating him from the bondages of material nature. Controlling his mind & senses, and by suitable practice and detachment, such a transcendentalist is able to successfully meditate upon the Supreme Lord ,who is the cause of all and everything that is, and thereby he further advances in his spiritual life. But the culmination of all the yogic processes of Karma, Jnana and Dhyana is to ultimately reestablish the loving relationship with the Supreme Lord and render devotional service unto Him, as confirmed by the Lord in Bhagavad Gita.Such a Yogi, who serves the Supreme with Bhakti (unalloyed Love), is the most intimately united with Him in yoga, and is the highest of all the yogis. The devotees (bhaktas) of the Lord are hence residing on the highest platform of yoga, and are unleashing themselves to realize the ultimate treasures of the love of God – and are enroute to achieving the complete perfection of their lives.